Support Center > Knowledge Base> Article: How to buy Bitcoin with Bitstamp and fund FXChoice account? Open your browser and go to https://www.bitstamp.net/. Click either ‘Register’ or ‘Create account’. You will be forwarded to the ‘Open free account’ page. 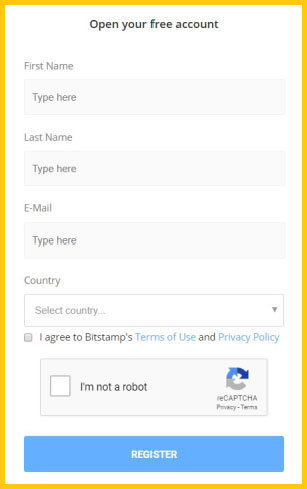 Fill in the form, tick the box to agree with Bitstamp’s terms and conditions and click ‘Register’. You'll see a notification confirming that your registration is complete and that you'll receive your user ID and password via email. Check the email in your inbox and take note of both the client ID and password for your account. Then return to the Bitstamp website and click ‘Log In’. Enter the relevant username and password details. When you first log in to Bitstamp, you'll see a notification that your password is out of date. Click the link to change your password. On the new screen, enter your current password in the field at the top. 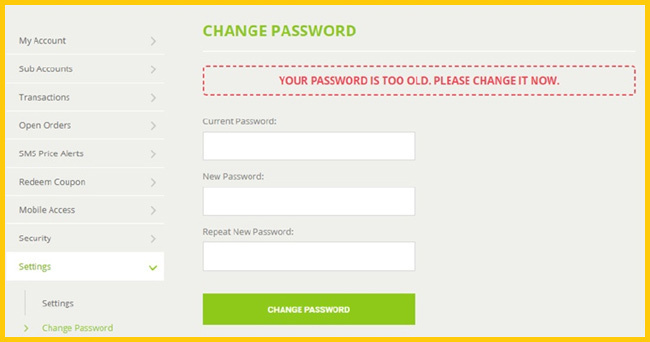 Next, put your new password into the fields. Start the verification process by going to https://www.bitstamp.net/account/verify. You'll first be asked to choose between a personal and corporate account. If you're a private individual, click ‘Personal Account’. The next verification screen will ask you to verify your ID and enter your name, residential address, date of birth and declare whether you're a US Citizen or resident for tax purposes. Scroll down and click the ‘Browse’ button to upload the image of your ID. Use the fields below to enter the dates of issue and expiry. The next step is to submit your proof of address. Click the ‘Browse’ button to upload your proof of address. This must be either a bank statement, a utility bill (such as a gas bill) that is no more than three months old, or a government document such as a tax certificate. You cannot use your ID here, even if it shows your address. Click ‘Submit Verification Request’ at the bottom of the screen. Bitstamp will review the information and documents you provided. If they are valid, your account will be verified in 2-3 working days. You must wait for this to happen before you can buy Bitcoins. Enabling two-factor authentication means Bitstamp will request a special code from your mobile device when signing in or processing transactions. To use it, you'll need a suitable app for your phone such as Google Authenticator or FreeOTP, which are free to download on the iTunes and Google Play stores (for iOS and Android, respectively). Go to https://www.bitstamp.net/account/security/two-factor-authentication and click ‘Enable two-Factor Authentication’. You will see a QR code which you can scan in using your mobile app. If you have a Visa or Mastercard and live in an EU country (including the UK), you can purchase Bitcoin instantly using your credit card. To get started, go to https://www.bitstamp.net/account/deposit/credit-card in your browser and click ‘Buy’ underneath the amount of BTC you wish to purchase. If you're unable to use a credit card to buy Bitcoin, you can deposit funds with Bitstamp via your bank account instead. To get started, go to https://www.bitstamp.net/account/deposit. Once your funds are confirmed, the simplest way to purchase Bitcoin is an instant order at the current bid/ask price. To place an instant order, go to https://www.bitstamp.net/market/order/instant. Click ‘Buy BTC’, then in the ‘I want to spend’ box enter the total amount of funds you want to use for buying Bitcoin. This amount includes Bitstamp's fees. Click ‘Buy BTC’ underneath to place your order. Once your order is processed, the amount will be added to your BTC balance. Going to https://www.bitstamp.net/market/order, you can place a ‘Limit Order (Advanced) or ‘Stop Order’. You can also place a ‘Stop Buy’ order to purchase when the price rises to a certain level, again optionally with a ‘Trailing Stop’. Once your Bitstamp account has been funded with your desired cryptocurrency, you can quickly fund your FXChoice trading account by logging into your Backoffice, going to the Deposit page and choosing the funding method. 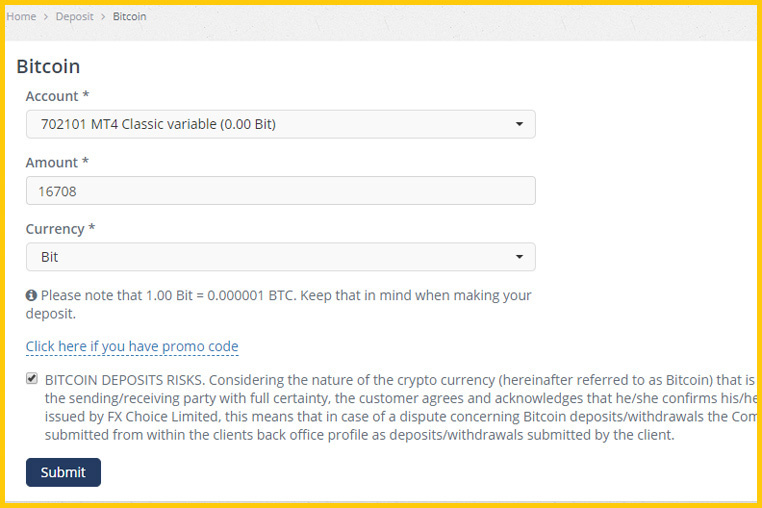 Within Backoffice, go to ‘Deposit’ and select ‘Bitcoin’. Fill in the form and submit the request. A Bitcoin confirmation screen will be generated for you to confirm your transaction. Even though you made your deposit in BTC, it will automatically show up in Bits. Continue by clicking ‘Confirm’. A payment notification will be generated. This notification provides you with the cryptocurrency address to send your funds to. When entering the address, it is important you enter the address exactly. We recommend copying and pasting this information to mitigate errors. Once you have our cryptocurrency address, go back to Bitstamp to complete the process by making a withdrawal from your Bitstamp account to our FXChoice cryptocurrency account. Enter the FXChoice cryptocurrency address in the appropriate field along with any other necessary information and submit your transaction. Once you submit the form, we recommend allowing up to 24hrs for your cryptocurrency to reach your FXChoice trading account. Typically, transactions take 1-2hrs.